Count D’s pet shop in Chinatown is infamous for its stock of exotic creatures and the strange incidents involving most of its customers – many of whom end up dead. Rumours abound about the shop selling “magical” creatures and even being involved in human trafficking. But the elusive Count D never seems to be available and is always “travelling” according to his grandson who runs the shop. This, in conjunction with the fact that Chinatown is a place that local police naturally try to avoid (if not ignore completely) leaves investigators unable to dig any deeper into the mysterious affair. The storyline is intriguing, enjoyable and well-paced. The majority of it is made up of a whole lot of smaller stories, linked together to by an ongoing plot. Each of these stories contains either a moral or philosophical message within it; sometimes even a humorously ironic one. The character development is only a little short of first-class but because the characters themselves are rather three-dimensional to begin with, the reader can quite quickly and easily become attached to them. As for the artwork, I really enjoyed it. Pet Shop of Horrors was a good mixture simplistic and extremely detailed art (not very common in manga), boasting some really beautiful backdrops. As for the actual layout, it’s really creative, making sure to break any hint of monotony and adding some great expressiveness to the story. If I were to summarise it, I’d say that Pet Shop of Horrors is probably the closest to the perfect fusion of eastern and western comic influences. On top having a great storyline, good character development and really nice artwork, the manga also has a decent volume to it with forty-one chapters over ten volumes along with two bonus side-stories. Apart from being an holistically entertaining experience, Pet Shop of Horrors has a very satisfactory ending so have no fears about being deflated at the end of the last chapter. All in all, it’s definitely worth a read since I think almost anybody would get something out of it. 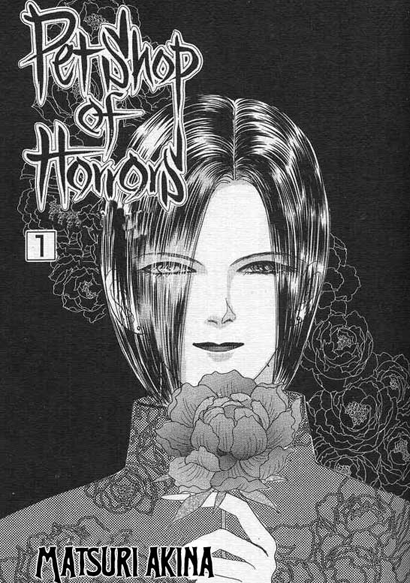 This entry was posted in O-Blogive, Otakudom and tagged Akino, horrors, manga review, Matsuri, Matsuri Akino, pet, Pet Shop of Horrors, shop on February 24, 2010 by nonzyro.